Before your customer takes that first bite of a luscious strawberry, a crisp apple, or a refreshing plate of greens, their eyes inconspicuously search for flaws. It isn’t just important that food smells and tastes good, the presentation needs to be just as visually appealing. Everything from discoloration to perceived changes in texture can tell them produce has seen better days. If the food you are serving is not as appealing—on a plate, self-service counter, buffet station or deli display case, you may want to think about making some adjustments to the way you are handling and storing it, particularly if your fruits and veggies are showing signs of accelerated deterioration. These unappealing changes are caused by a combination of the following common culprits: air and oxygen, moisture, light, microbial growth, and temperature. There are a number of classic and modern tricks to keep fruits and vegetables at top presentation quality. Here are some of the best and most cost-effective solutions. The best method for banana storage depends on how the consumer is going to first see them. It’s true that banana peels quickly blacken in cold storage, but the fruit inside will actually continue to look and taste fresh for longer if stored in the cold. When a yellow peel is the goal, it helps to wrap the banana stem in plastic to limit the fruit’s exposure to ripening gasses. For fresh-looking slices, cold storage in the peel is best. Wash all produce under running cold water before prepping or dicing and not before. Washing product upon receiving will cause premature spoiling. Immediately refrigerate any fresh-cut items such as salad or fruit for best quality and food safety. Use a colander when washing leafy greens like kale, cilantro, mint leaves, or parsley. Place the produce inside a colander under running cold water, scrub with your hands then place in a food storage pan. Liquid will drain easily into the food pan below for enhanced food quality and reduced handling. Colanders simply lift out of the food pan for safe and quick disposal of liquids. In commercial environments, higher quality storage containers are a sound investment. 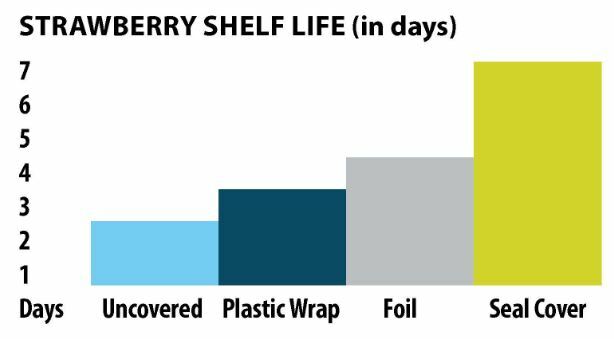 The trick to maximizing shelf life is to control the food’s environment as much as possible by keeping out air, additional moisture and microbial cross-contamination. Even a day can make all the difference in the appearance of produce. Smart storage slows discoloration and molding so the fruits and vegetables on every plate look their best. 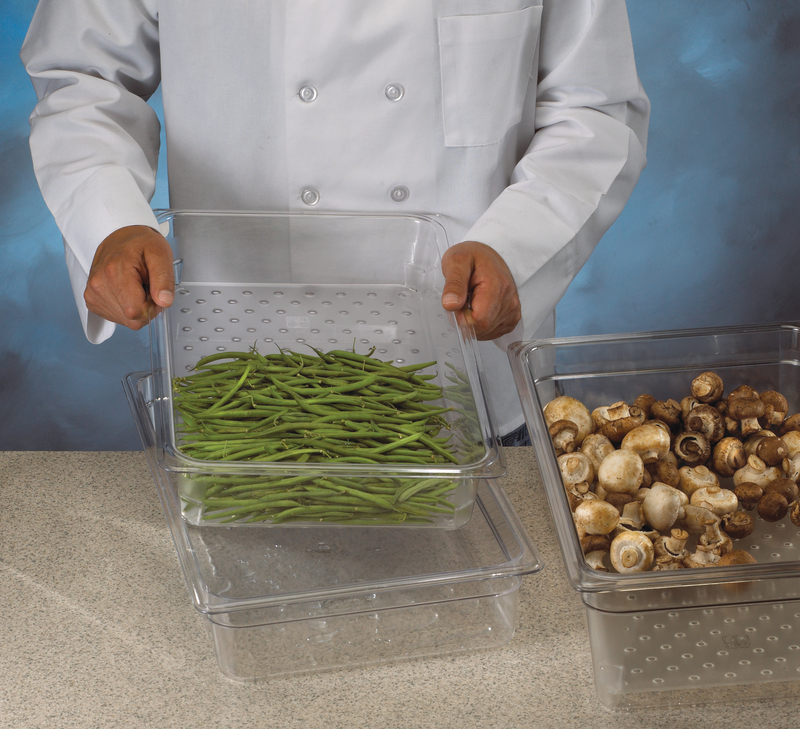 Third party laboratory testing has shown that when used properly with a Cambro Food Pan, Cambro Seal Covers can extend the shelf life of produce by two to three days beyond storage with disposable wraps, foils or no cover at all. Want to see for yourself? Ask your Cambro rep for a copy of our third-party shelf life testing results and a free product sample. Try the test with fresh strawberries or spinach and ensure that everything you serve passes the eye test!